5 810,26 € Tax incl. 4 841,88 € Tax excl. 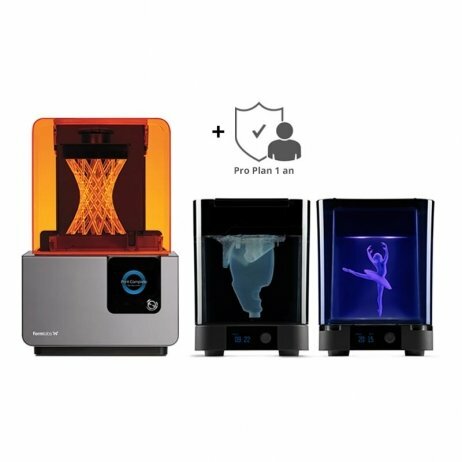 The Form 2 is the new SLA printer from Formlabs. With a very high print volume and simple operation, discover professional stereolithography with the Form 2. Pre-order: Delivery from November 2015. 3 958,80 € Tax incl. The build plate for the Form 2 3D printer is removable and lets you detach printed parts easily. An additional plate lets you start printing immediately after replacing it. The resin tank is the transparent tray containing the liquid resin in the heart of the Form 2. This tray can be easily removed and replaced to work quickly and efficiently with different kinds of resin. Dental SG Form 2 resin is a Class 1 biocompatible resin (EN-ISO 10993-1:2009/AC:2010) you can use on your Formlabs 3D printer. This resin can be used to create surgical guides for implantology with an accuracy of up to 100 microns. Cartridge packaging 1L. Important: for use with a NextDent LC-3D UV chamber for biocompatibility. Form 2 Dental SG Resin V1. Formlabs flexible resin has amazing properties and can be used in the most advanced fields. 1L cartridge packaging. Form 2 Flexible Resin V2. High resistance for the most durable resin on the market from Formlabs for the Form 2. 1L packaging. White Form 2 resin can be used on your Formlabs 3D printer. Specially formulated to deliver the best results, this resin provides an exceptional finish without sacrificing durability and solidity. 1L cartridge packaging. Black Form 2 resin can be used on your Formlabs 3D printer. Specially formulated to deliver the best results, this resin provides an exceptional finish without sacrificing durability and solidity. 1L cartridge packaging. Grey Form 2 resin can be used on your Formlabs 3D printer. Specially formulated to deliver the best results, this resin provides an exceptional finish without sacrificing durability and solidity. 1L cartridge packaging. Clear Form 2 resin can be used on your Formlabs 3D printer. Specially formulated to deliver the best results, this resin provides an exceptional finish without sacrificing durability and solidity. 1L cartridge packaging. Form 2 Clear Resin V2.